From The Muppets and KFC to Guy Fieri and Gordon Ramsay, here are all the celebrity chef cameos from The Simpsons. After 29 seasons, The Simpsons has racked up quite a number of guests stars. That includes one of the culinary world's most famous names, Mario Batali, who will appear this Sunday as part of the show's famous annual Tree House of Horror Halloween episode. 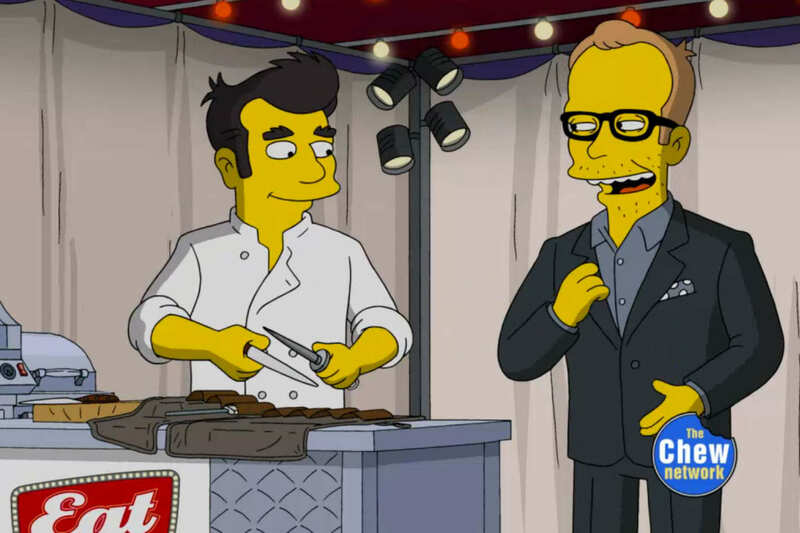 The cannibal-themed segment featuring the Crocs-lover and co-host of The Chew isn't the first time he or any other celebrity chef or cooking personality has dropped by Springfield—never mind the number of fictional chefs that have. 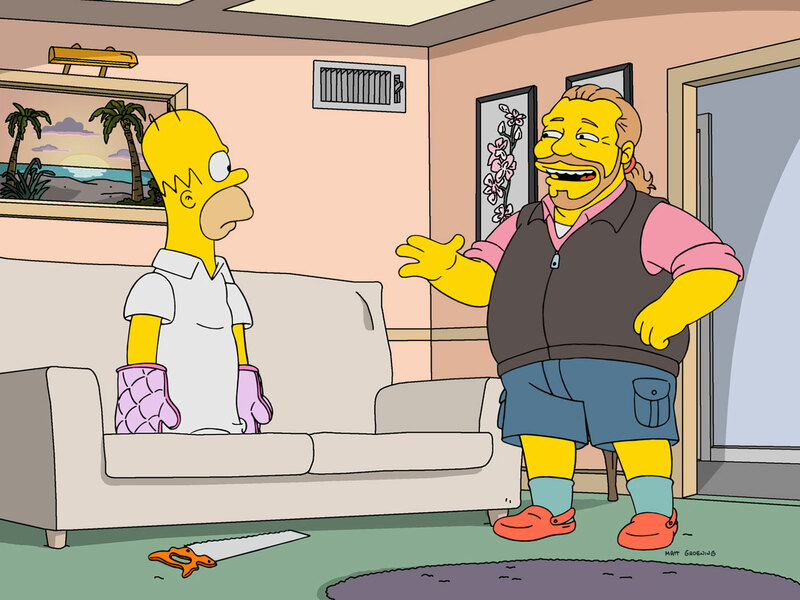 Here's a list of Simpsons cameos made by some of cooking and TV's most recognizable faces. This Sunday, Batali will fire up the burners for his most horrific meal yet: Homer Simpson. But cooking up one of animation's most famous faces won't mark the first appearance of the chef on the show. Back in season 23, Batali cameoed as part of the foodie-inspired episode, "The Food Wife," where Marge, Lisa, and Bart start a food blog. Author and one of the food world's best known "bad boys" also made his sole appearance during The Food Wife episode. Tony Bourdain—who likes to be paid in emeralds—appeared as a figment of Marge's foodie nightmare after she invited Homer to join in on her and the kids' "thing." Early last month the Iron Chef and Cutthroat Kitchen personality had foodies rejoicing when he announced that his beloved series Good Eats was making a comeback. In the season 27 episode, "Cue Detective," Brown, as himself, hosts a Chew Network smoke-off competition between Marge and an acclaimed fictional celebrity chef. This classic Muppets character is known for being hilariously indiscernible due to his accent, which he showed off during the Simpson's food-centric "The Food Wife." The Muppets chef appeared as part of Marge's dream sequence on a bouncy ball train of chefs who bounced around a market praising Homer as "food dad." Julia Child, the iconic expert of French cuisine, journalist, author, and spy, would also appear in the season 23 episode about Marge finally getting a fun "thing" that she and the kids could share. While some of the other chef's offer words of disparagement to Marge, Child's smiling presence only serves as a visual reminder of everything Marge would lose if she let Homer join her and the kids at the exclusive tasting. 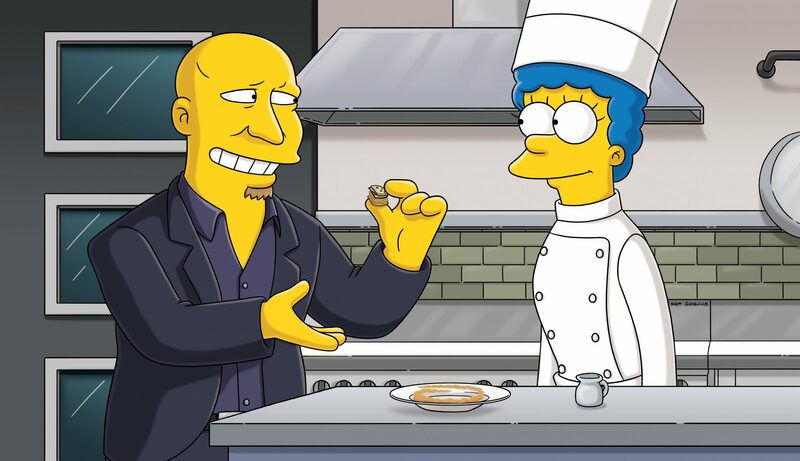 Iron Chef judge and American celebrity chef Colicchio made his cameo in season 23's "The Falcon and the D'ohman." As part of another cooking dream sequence, Marge appears as a contestant on an Iron Chef-like show where Colicchio served as the judge. He lacked any dialogue (a somewhat missed opportunity considering the chef's personality and notorious flame shirt), but Fieri appeared in "The Food Wife" as part of Homer's chef train. Fieri was the last cooking celebrity Marge saw bounce away (on the shoulder's of Paul Prudhomme, no less) before Gordon Ramsay offered an expletive-filled rant about how un-fun Marge is. Prudhomme makes his second Simpsons's cameo in "The Food Wife" as the ball Guy Fieri bounces away on in Marge's nightmare. But a chef in a New Orleans restaurant has a striking resemblance to Prudhomme, who appears in the eighth season's "The Simpsons Spin-Off Showcase," an episode about fictional backdoor pilots as commentary on TV's poor, unoriginal television writing. 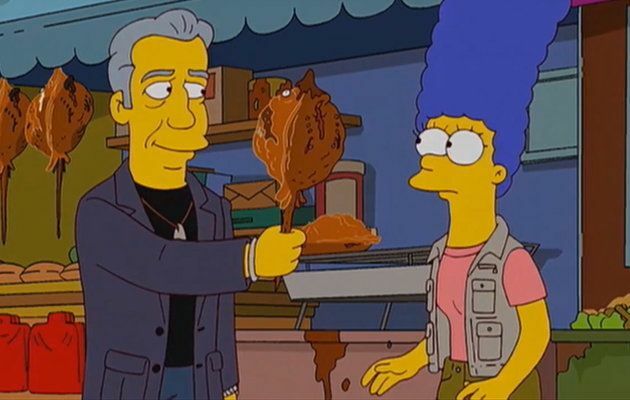 The Austrian-born chef, cookbook author, restaurateur and occasional actor, appears in The Simpsons' "The Bart Wants What It Wants." The episode mostly focuses on Bart falling in love with Greta, a girl from Springfield's private school, which is where Puck's cameo gets a little complicated. 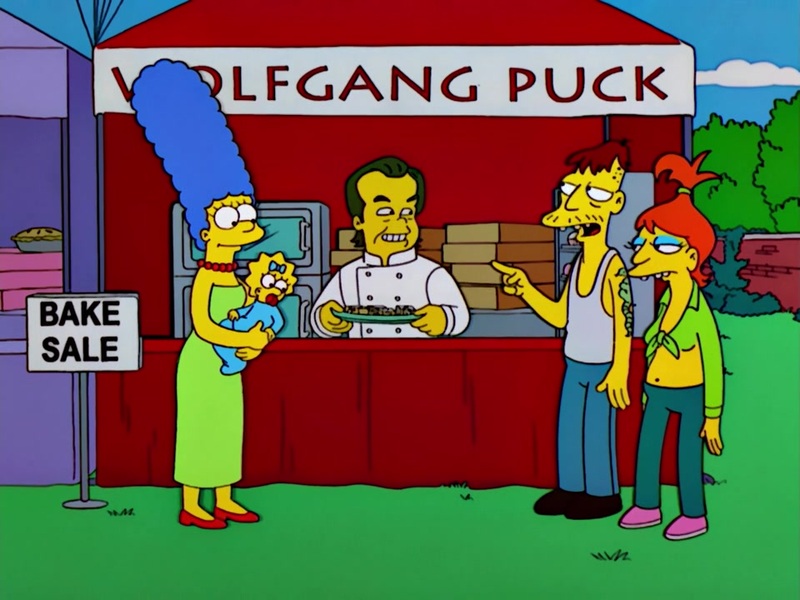 Puck doesn't actually play himself (unlike most of the other celebrity chef's on The Simpsons). Instead, he voices Greta's father and action star Rainier Wolfcastle. 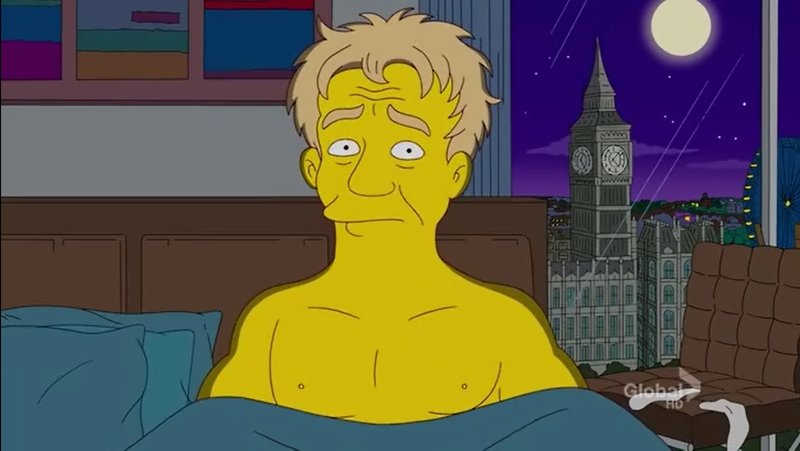 Rather surprisingly, before "The Food Wife," the British chef and TV personality had not yet appeared on The Simpsons, which airs on the same network as his cooking competitions and reality show hits Hell's Kitchen and MasterChef. Ramsay, one of the few chefs not featured as part of Homer's "food dad" bouncy ball parade, berated and belittled "Big Blue" in her dream about inviting Homer to her exclusive restaurant outing with Lisa and Bart. A different kind of "celebrity" chef, Colonel Sanders (who was a very real man with a surprising and not very lucrative hobby) made his lone appearance in "The Food Wife" as part of the train of admirable chefs leaving Marge in the dust in favor of Homer. These days, when Stewart isn't teaching home cooks in the PBS series Martha Stewart's Cooking School, she's keeping herself busy with Snoop Dog and their show, Martha and Snoop's Potluck Dinner Party. 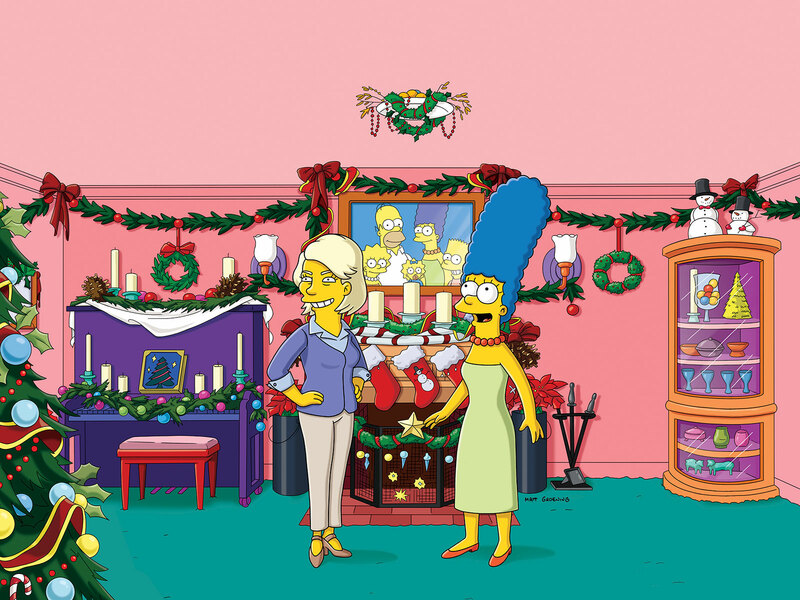 But before the lifestyle guru and cook had these projects on her plate, she cameoed during a Simpsons Christmas episode in 2010 as a militant bringer of Christmas cheer, re-vamping The Simpsons' home to forcibly get everyone in the holiday spirit.